Why is SEO Important - AIMWEB Global Web Solutions - Leaders in Search Engine Optimization, Pay Per Click Management and Search Engine Marketing. Cape Town, South Africa. 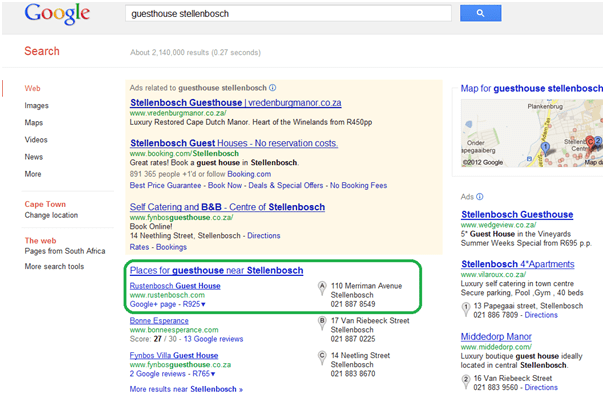 That is because I do not know what your guesthouse is called and therefore I choose a combination of keywords (in my case “Guesthouse Stellenbosch”) in order to find ANY guesthouse that will meet my requirements and as soon as I have found something that fits with my expectations and my budget I will not looks through any more search results. The above keyword combination “Guesthouse Stellenbosch” is one of numerous keyword combinations that the potential customers of your guesthouse may be looking for. Such keywords may be “Bed and Breakfast Stellenbosch” or “Accomodation Stellenbosch”. A successful online marketing SEO campaign can bring ‘targeted’ customers to your business. These customers are targeted because of the specific keywords and keyword combinations that we cater for. In the next section called “Doing SEO keyword research” we will address the topic of how to go about picking the winning keywords in order to get the most traffic to your website, which will result in more customers and more sales.